The exhibition ranges far and wide across the region. Photography as vocation and avocation came together in a new and unexpected way when he signed a lease for the small storefront between Porter and Davis squares. Kids of all ages will enjoy these art shows in Boston and beyond. The master cartoonist had a biting wit about social and political change, but his humor is a good entry point for learning hard truths. Curator Maya Erdelyi’s lively “The Skin Has Eyes: Animated Visions,” at the Boston Center for the Arts’ Mills Gallery, celebrates old-school animation techniques. “William Hunter and the Anatomy of the Modern Art Museum” looks at a pivotal individual. 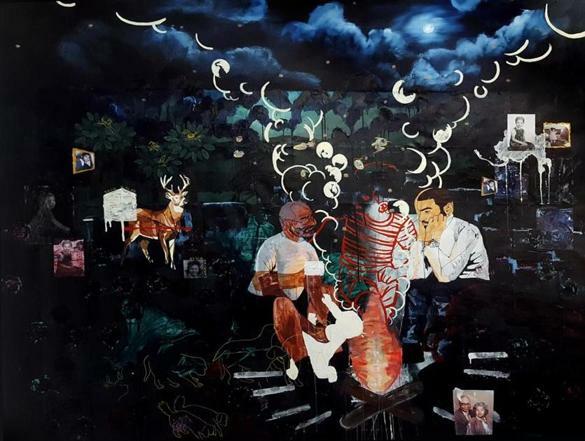 Jordan Seaberry, who is spotlighted in the “deCordova New England Biennial 2019,” addresses systemic injustice, family wounds, and moving forward in his powerful, imagistic paintings. In “Aera Synthetica,” artworks explore the fact that we’re part of nature. And we’re changing it, all too quickly. In a fascinating show, the Worcester Art Museum puts on view the Impressionist master’s paean to a rapidly-changing world. The Seaport has commissioned artist Daniele Frazier to create “20 Knots: Daffodils for Boston” ahead of the Boston Marathon. Bouchra Khalili’s video piece at the MFA burnishes a historic moment ripe for our trying times. The Globe’s guide to the best things to do this weekend. The Metropolitan Museum offers daguerreotypes, the Morgan Library highlights from the National Gallery of Canada. Art experts in Britain have discovered that a painting thought to be a fake Sandro Botticelli in fact came from the master’s own Florence workshop. The artist’s affecting new sculptures evoke the perils of the flesh. For too long, remembrances of Martin Luther King Jr. have failed to do what King did in his lifetime. There’s a continuum of carnage in Huma Bhabha’s artwork. It’s also exuberant, dynamic, and playfully alive. A show at the Portland Museum of Art captures the complexities not visible in tourist brochures. A very eminent Victorian remains a force for how we understand art and society. Siddharth Choudhary, who grew up in India, creates punchy digital drawings that reflect how places intersect in our psyches. The Institute of Contemporary Art Boston will present Yayoi Kusama’s “LOVE IS CALLING” starting Sept. 24, according to ICA director Jill Medvedow. From the heartbreaking to the holy, “Plastic Entanglements: Ecology, Aesthetics, Materials” and “Konstantin Simun: The Sacred in the Profane” explore the medium. Robert Gentile maintained Monday that he knows nothing about the still-unsolved theft from the Isabella Stewart Gardner Museum. The heist took place 29 years ago today.